Buy 4 products, Get 1 FREE! Offer ends 6/30/2019.Free goods will be shipped directly from manufacturer. Redemption coupon will be included with your order. Universal light-cured composite utilizes a new monomer technology from DuPont to create a putty-like property that allows the material to spread easily. The prepolymerized fillers eliminate problems associated with composite sticking to the instruments. Luster and polishability are a result of the monomer’s long chain. The low shrinkage stress around the fillers provides better durability and longevity of the restoration. Available in 2 opacities and multiple shades for precision matching and polychromatic stratification. Contains: 20 x 0.16ml Unitip capsules. Contains: 10 x 0.16ml Unitip capsules. Contains: 50 x 0.16ml Unitip capsules (20 x A1, 20 x A2, 10 x BW). Contains: 1 x 4g (2.0ml) syringe. Contains: 3 x 4g (2.0ml) syringes (1 ea. A1, A2, BW). 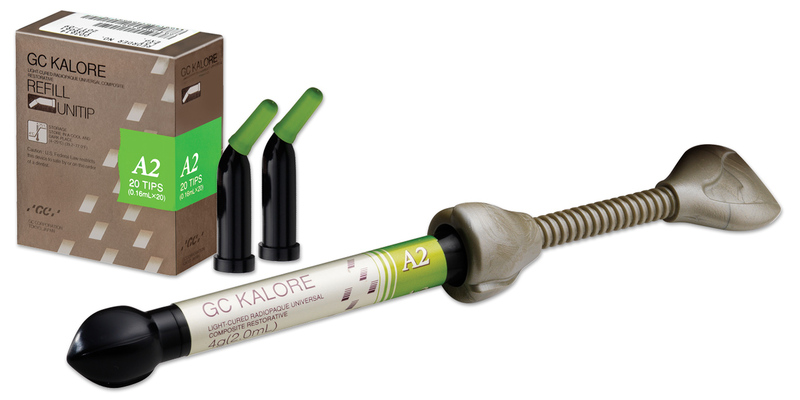 GC Kalore is a low-shrinkage, universal nanofilled composite indicated for use in all classes of direct restorations. This composite combines a new monomer from DuPont along with UDMA but contains no Bis-GMA. The product contains High Density Radiopaque (HDR) pre-polymerized fillers. Curing time is 20 seconds with a standard halogen or LED light for most shades. 178 GC Kalore restorations were placed and monitored over a three-year period. Recall ratings for 87 restorations were recorded and are included in this report. Of these restorations, 93% were posterior and 7% were anterior. At recall the following categories were assessed on a scale of 1-5 (1=poor, 2=fair, 3=good, 4=very good, 5=excellent). Resistance to Fracture/Chipping: GC Kalore proved to be very durable during the three-year recall period. Over 98% of the restorations evaluated received >an excellent rating. Of 87 restorations, one had a slight chip that did not require treatment and one fractured, requiring replacement. The fractured filling was a Class II restoration on tooth #20. Esthetics: 90% of restorations were rated excellent for esthetics at three years. The remaining 10% were rated very good and showed minor discoloration or lack of blending with the tooth. Superior esthetics was obtained when shades >were layered at placement. It blends well and has a high quality of finish and polish at placement; restorations maintained an excellent finish over the three-year period. Resistance to Marginal Discoloration: The majority of restorations placed were resistant to staining and marginal discoloration. 95% of restorations evaluated received an excellent rating. Four restorations showed slight staining at the margin. Wear Resistance: Only one restoration was observed to have slight wear at year three. That restoration was a Class I filling on a second molar. The remaining 86 recalled restorations rated very good or excellent for wear resistance. GC Kalore universal composite had excellent ratings for resistance to chipping/fracture, resistance to marginal discoloration and wear resistance over a three-year period. Shades blended well and excellent esthetics was maintained. This product received a 98% clinical performance rating.